Why are MTP repair products different from Auto Body materials? Hello, I have a question about your acrylic filler and granite materials.. One, should the clear coat be white in color, it looks cloudy, not clear. Two, everything for the repairs pastes are different in consistency from body fillers for spreading and shaping. Third, the product is very hard when cured making it harder to sand. Is this how it’s supposed to be? It doesn’t seem correct to me being a body repair tech for 25 years, clear is never cloudy and this filler repair when cured is hard as nails and not easy to sand? The cloudiness of the clear is correct for the product. It is rich in resin bringing a high solids content to the product. However, this will not cause it to be visible on the surface of the repair. Everything else you describe is normal. The hardness of the end product will provide a higher quality repair with greater endurance in the spa and bath surface repair applications. Your comments about the consistency of the acrylic resins are normal opinions from an auto body person’s experience base. Most auto body products are developed for ease of workability, while giving good performance in the relatively dry environment that vehicle surfaces must endure. Body filler, spot putty’s, primers and automotive coatings (having ease of use) will all absorb water and fail, especially when used for a bath tub or spa surface repair. 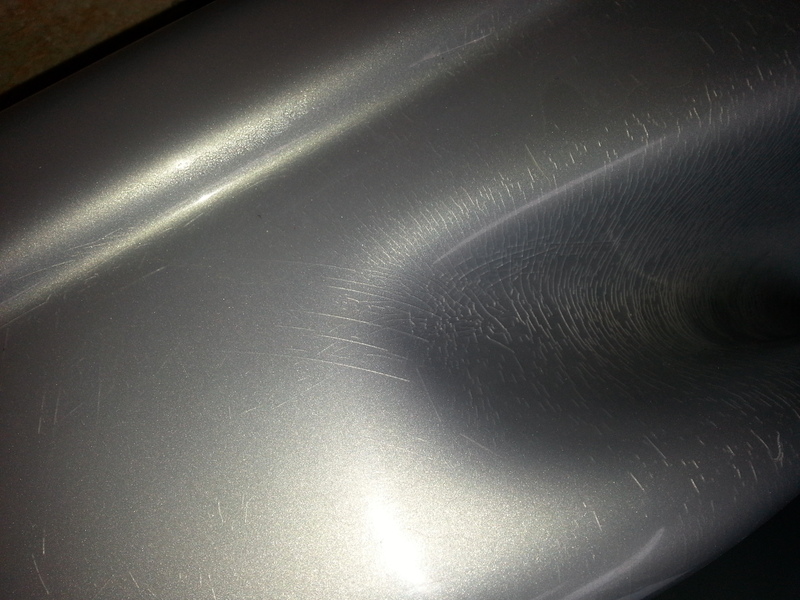 The picture shows how auto body fillers fail when used for bath or spa repairs. Since bath tub and hot tub environments are wet environments (water, heat and chemicals), they require resins which contain high levels of special additives to prevent moisture absorption, so they will provide the expected durability and performance. Thus, the completed repair is much harder than in auto body repair materials. At the same time, these special additives impart color and translucency to the initial clear resin. The chemistry of these additives are designed to be compatible with the base resin and provide the desired properties for superior performance. Unfortunately, this means they may be more difficult to work with. 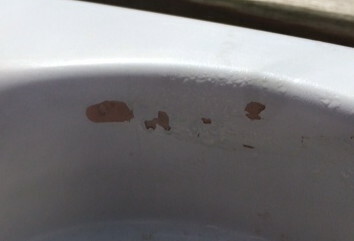 A hard surface in a bathtub or spa repair results in better performance. A good rule of thumb; if the product sands, shapes and works easily (softer), it will absorb water and deteriorate in a very wet environment. Auto body pastes and epoxies fall in this category. Even though these plastic products may be more difficult to work with, they have been designed for the purpose. These issues are minimized with the use of proper tools. Aggressive grinding and shaping will require applying the filler in multiple layers. To fill voids, skim coat applications, using the same filler, will provide maximum performance in the finished repair. Your comments and observations are expected. We have many repair techs from the auto body industry using our products. Understand there will be a learning curve while adjusting application and working techniques when transferring to Multi-Tech surface repair products. I hope this helps, and good luck with your repairs.